I feel kind of funny creating a new blog and then not actually updating it for a week, but I've been busy with work (retail right after Christmas = bleh) as well as simply enjoying the game for its own sake. My trooper hit level 31 today after a bit less than two weeks of playing, which almost feels a bit fast, but I think part of that is due to the fact that I play grouped the vast majority of the time and group bonus experience is simply insane. Our little trooper team outlevelled an entire world pretty much by accident (weren't we supposed to go to Taris? oops), so we only popped over there briefly to do our local class quest and pick up our newest companion. To be fair though, we did do a lot of random mob killing and flashpoints in-between... either way, that just means that whenever I level another Republic character, they'll have an entire planet of adventures ahead of them which I haven't even seen yet. I think it's interesting that a lot of bloggers seem to have concerns that even if they are enjoying the game right now, they'll probably run out of things to do a month or two from now. I definitely can't see that happening to me. For comparison, I played WoW for over nine months before I even started to raid, and I played a lot. Somehow there always seemed to be something to do back in the day, whether it was doing extra quests, exploring, gathering money for an epic mount, working on my professions or running instances with friends. Just from what I can see now, SWTOR seems to be shaping up to offer a similar kind of experience to what I used to love back then, and I think it will keep me busy for quite a while. I do think the guild that I'm in intends to raid eventually, but I'm not too bothered about that right now. We'll see - there are definitely enough other things to keep me occupied. First off, there's my class quest to finish. Considering the way it has been progressing in relation to my level so far, this will likely happen some time after I hit the level cap. Then there are my companions, whom I'd really like to be friends with, but I've made very little to no progress with that so far. I'm currently taking Aric everywhere and he's starting to grow on me, but still, he only just gave me his first companion quest. The others simply get to hang out on the ship and receive the occasional gift, but the feeling's not really there. I reckon that getting to know them properly is going to be a time-intensive process. I've also caught myself wondering what it would be like to level another trooper and make another companion my "main" who gets to go places with me, because I'd like to see how that changes the quest experience. Then there are my crew skills. I've been trying to level them as I go along and on the whole it's been working well, but some of them have started to fall behind a little, and catching up will take time as well - quite literally, as missions and crafting take longer the higher your skill gets. Apparently there are some things about the system that are kind of wonky right now, but I think it's a fun enough mini-game, and the ability to reverse engineer everything into blue and purple versions of the same item may have limited usefulness but is a completionist's dream. Got to discover them all! Money matters, which is something that I've found really refreshing. I've actually had to sometimes decide to put certain things on the backburner for a bit in order to afford something else that I wanted; for example I temporarily stopped training new skills and running crew skill missions at level 20 to save money for my first speeder, like the little helpful "beginner's tip" window suggested. Incidentally, that was incredibly well timed, because I started saving as soon as it popped up at 20 and ended up with pretty much exactly the right amount for my speeder plus training once I hit 25. Uncanny. I can already see a lot of money sinks that I can't afford right now but that I will enjoy working towards in the long run, such as more bag and bank space. Finally, exploration also looks like it will be incredibly rewarding in the long run. I haven't really focused on it much right now, just making sure that I uncovered all the major areas on the map on each new planet, but I've only seen two holocrons (hidden items that give permanent stat boosts) so far and I'm sure that there are much more. My brother back in Austria, who plays too, actually talked to me on the phone about this one holocron on top of a sandcrawler on Tatooine and how you had to jump off a balloon to get it and I was just like... "What?" I hadn't even been to Tatooine yet by that point and had no idea what he was talking about; it just sounded mad. I still haven't looked into the details yet, but I heard someone talk in Tatooine general chat about how he and a Sith Warrior were staring each other down on the balloon and it just sounded funny. It feels like there's a whole world of crazy holocron-hunting hijinks out there, waiting to be discovered. And then of course, there'll be flashpoints with friends. The other night I actually went back to the Esseles to help out a low-level friend and an alt who didn't have a single healing ability between the two of them. It wasn't exactly a boost, but I was certainly too high level to get any great benefit out of it - still, it felt good fun and I got to mock the goodie-two-shoes Jedi for trying to reason with a Sith. I mean, really? It's nice to experience group content for the fun of it again instead of grinding currency with strangers, and I expect to get a lot of mileage out of that even past the level cap. There's a lot to look forward to in this galaxy far, far away... what are other people's long-term goals? I've been following blog posts about people's first impressions of SWTOR with interest, and as was to be expected, there are both features that people love and things that they hate. That's fine. However, there's one little argument that I see coming up every now and then that bugs me because I feel that it's truly based on nothing. The latest instance of this was in this post by Tobold, and even though several of his commenters already spoke up about it, I'd still like to dedicate a whole post to the subject regardless. "SWTOR is just a big single-player RPG." I'm not sure who originally coined this phrase, and to be fair, to a certain degree it's a fair assumption to make. The game was always advertised as being a lot like Bioware's single-player games, and if you've ever played any of those you're likely to think of features such as having personal conversations with NPCs and companions that follow you around because you're going to save the world together... surely that can't work well with other people around? Well, yes and no. It is a bit weird that every trooper in the game potentially has the same cat-man following them around as I do. However, it's something that's easy enough to ignore, as it's not as if you get to listen in on everyone's private NPC conversations, and over time, people acquire a variety of companions that they can dress up in different outfits, so after a while they tend to look different enough that you hardly notice the similarities anymore. Not to mention that from a roleplaying point of view, different companions do kind of evolve into different people depending on how you treat them. My boyfriend's little helper may be called Aric too, but while his is a very happy fellow because my boyfriend's trooper does a lot of things he agrees with, mine is rather grouchy because he doesn't approve of the way I sometimes sass my superiors. Talking to NPC quest givers in a group was also solved in a (in my opinion) very elegant manner - when I first saw this in action in a gameplay preview video, that was the tipping point that got me from "completely uninterested in SWTOR" to "I might just have to check this out". You basically pick what you want to say, dice are rolled, and whoever wins gets to speak and decide the outcome. If you are really concerned about possibly being subject to someone else's decisions, you can always chat with the NPCs separately, but personally I wouldn't want to because it's just so much more fun in a group. 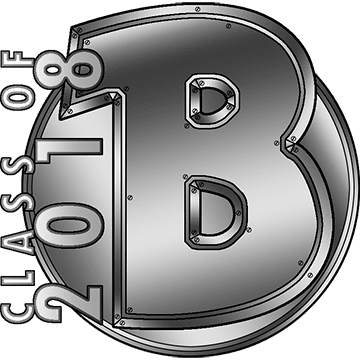 It tends to shine an interesting light on your fellow players' characters, as whether they decide to save or kill some innocent bystanders says a lot more about them than a 3000-word character biography ever would, and if people disagree with a decision it's always a good conversation starter. ("I can't believe you killed those engineers, you jerk! We're not in that much of a hurry!") You also earn a currency called social points, which is only good for some cosmetic rewards as far as I'm aware, but adds another layer of friendly competition to wanting to win conversation rolls. Anyway, so far I've only detailed how two of the things that you would consider strictly single-player features aren't all that at odds with grouping, but more importantly, voiced NPC conversations and personal companions simply aren't all there is to the game! There are optional group quests that are actually challenging in pretty much every sub-zone, and they can be repeated on a daily basis, so if another friend needs help with them the next day, you can help out and get rewarded again. (Keep in mind that this is different from daily quests, which are designed to make you repeat them.) Today my boyfriend and I were playing through one such area which had some pretty tough mobs in it and required some fighting back and forth, so when he spotted another group of players working their way towards us, he exclaimed: "Thank god, other players!" I laughed and asked him whether he could remember the last time he felt like saying that in a multi-player game. Likewise, the flashpoints (instances) are very fun too, both due to the challenge and due to the group conversations. Conveniently, they all start with a shuttle from the fleet, which allows players to naturally congregate and form groups there for pretty much anything. There are world raid bosses available across all levels. Our guild wanted to kill one of them last night but unfortunately for us he had already been taken down. Also, I don't know how this will play out at higher levels, but at least during the lower half of the levelling game so far I've noticed that even though the game embraces the holy trinity, it's quite easy to plug holes in your group with an appropriate companion, as long as people play intelligently and are willing to compensate a little for the not-so-clever AI, so you can mostly work with whatever you have without having to worry too much about grouping with the "right" people. Other than merely being fun, grouping also provides experience bonuses, and since most mobs actually put up a decent fight, forming a party makes things both more efficient and safer for your characters. At the same time the levelling speed seems close to Vanilla WoW to me, which means that you don't have to worry too much about outlevelling your friends by accident if you do anything at all without them, which gives both of you more freedom while still allowing you to play together continuously. 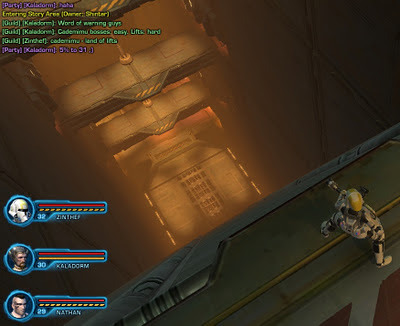 In conclusion, can you play SWTOR to the level cap completely on your own? Yes, but that's hardly news, is it? I believe that there was some outrage about this when WoW first did it in 2004, but this is 2011. The more important point is that there is still plenty of group content, and even the things that can be soloed are generally more fun to do with company (something that I don't find to be as true in current WoW anymore, for example). I don't know about you, but to me that's not un-MMO-like... in fact, it's exactly what I think a good MMO should be like. However, even if you don't agree, I would think that at the very least this kind of setup is anything but unusual and strange. Hello, I'm Shintar and I used to play WoW and talk about it a lot - still do in fact, but not as much. For now, my imagination has been captured by Bioware's new MMO, Star Wars: The Old Republic, and that's what I'm going to talk about here. You have my significant other to blame thank for the awesome blog title, as he's English and they just love their puns. 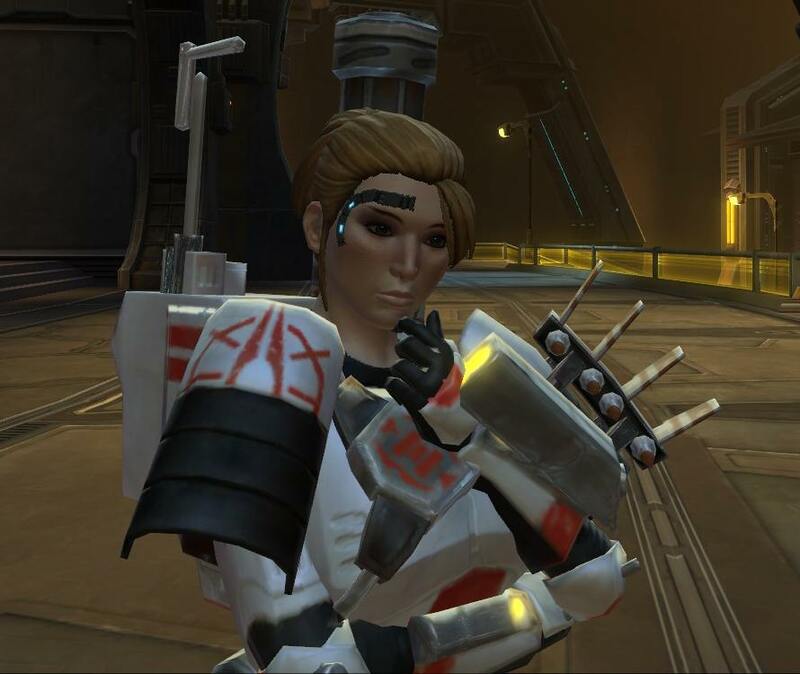 For those not in the know, Commando is one of the two advanced class options for the trooper in SWTOR, and what I'm playing as my main character right now. More specifically, she's a combat medic, because I seem to love healing no matter which game I'm playing. The blog's layout will most likely still receive some tweaking, though I generally do like to keep it simple anyway. I'm a 35-year-old Austrian who currently lives in the UK. I consider myself a gamer, but a fairly monogamous one, as I generally only devote myself to one game at a time, but then that devotion usually lasts for years. Gaming is an incredibly cheap hobby when you approach it like that. I got into MMOs by purchasing World of Warcraft in late 2006, shortly before the release of the first expansion, and I loved it. At first I just gushed about it on my personal blog and on various forums, until I created a separate blog dedicated to WoW only in mid-2009. I certainly had a good time with it, made many friends, and even met a special someone in my guild for whom I eventually decided to move cross-continent. Unfortunately I grew increasingly dissatisfied with WoW during the Wrath of the Lich King expansion and then Cataclysm, until I quit both the game and writing about it in early 2012. Still, your first MMO leaves its mark, so you'll have to forgive me if I sometimes draw comparisons between SWTOR and WoW. As far as Star Wars goes, I'm just young enough to not have seen the original trilogy in theatres until the special edition came out, which I loved. (And I don't really care who shot first.) As a result I went through a big Star Wars phase in my late teens, reading EU novels and everything, though my enthusiasm kind of fizzled out with the last of the prequels. I initially had no interest whatsoever in playing The Old Republic, until I saw a simple video demonstrating the group conversation system and heard that some of my friends were intending to play it. I then ended up making a complete turnaround from being utterly disinterested to becoming massively excited about the game within only a month or so, and even ended up pre-ordering to get into early access. As the blog title implies, I play a Republic Commando, specifically a combat medic, on the EU server Luka Sene The Red Eclipse Darth Malgus, though I have alts of course (as you do). I named her Shintar, after my troll priest main from WoW. At least one friend mocked me for my unoriginality in that regard, just to keep pestering me about other people's character names later on because he couldn't remember who was who. There is value in consistency, folks. I started my career in the game as a proud member of the Brotherhood of Remiel, a tightly knit social guild of mature players that did a little bit of everything, though they have now mostly moved on to other games. Fortunately I found a new home with the friendly folks from the Twin Suns Squadron since then. If you ever see Major Shintar O'sirisen around during your travels, feel free to say hi. If you'd like to contact me out of game, you can mail me at shintarcommando [at] gmail [dot] com. Or you can leave a comment on one of my posts here of course... I read all the comments, I just don't always have anything meaningful to say in reply. You can also comment on older blog entries if you have something to say; don't be shy - I receive automated e-mail notifications for those, so new comments will be seen.